Gravelly Oak is a small 'modern image' terminus layout set on a former Great Western Railway (GWR) branch between the period 2000 and 2017. Located on the border of the West Midlands and Shropshire. London Midland operate passenger trains but with minimal facilities provided. Like other stations of theirs in the area such as Hagley, it retains its GWR building to serve commuters of Gravelly. As well as the passenger services there is a quarry nearby loading trains with specialised aggregate. Locomotives can also be fueled and serviced at the stabling point here. This is a first foray into DCC though the small terminus layout served by a cassette fiddle yard is a similar concept to my DC model railway Todmorden Midland LMR, a 1950s layout which appeared in October 2016 Railway Modeller and has been on the exhibition circuit in the last year. The scenic base board is 4 feet 9 inches long with a 2 foot fiddle yard. Track is by Peco and control by NCE with traditionally operated Seep point motors with frog switching by autofrog units. Unlike my previous layout which had many scratch built buildings, this one uses modified resin and kit built structures. 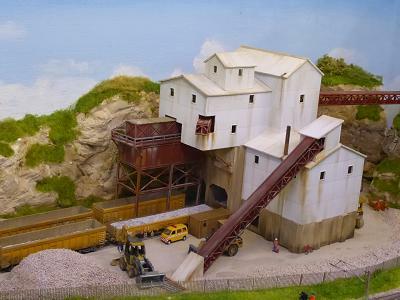 Scenics reflect the quarrying nature of the railway here and are created largely from Woodland Scenic products. Stock is by Farish and Dapol with DMU classes 150, 153 and 170 while locomotive classes 08, 60, 66 and 70 deal with haulage.